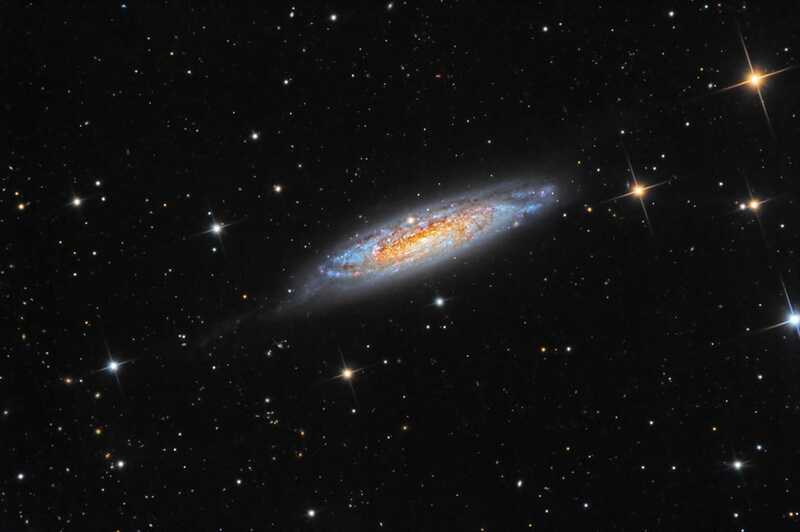 is an Sbc-type barred spiral galaxy about 60,000,000 light years distant, and spans 150,000 ly across, making it larger than our own Milky Way. Seen in a tilted, edge-on orientation, the galaxy has a bright core, and many pink, star-forming knots. Its warped disk is indicative of ancient, gravitational interaction with another galaxy- note the faint arm that extends leftward from 4 o'clock on the disk. Though John Herschel is credited with its discovery, he noted that it may have already been spotted by James Dunlop, six years earlier in 1828. This data is from the SSRO archive.